Triton opened Hoosier North Athletic Conference play with a win on the road in Royal Center Friday night. The Trojans (3-2, 1-0 HNAC) led just 19-15 at the half but scored at a 12-of-15 (80 percent) clip in the second half en route to their second straight win. Ashton Oviedo knocked down 6 of 9 shots — including 3 of 6 3-pointers — on his way to a game-high 15 points, while Keegan Westafer scored nine points, Lucas Richman finished with eight, and Jared Bules scored seven. Tye Orsund passed out five assists and tallied 11 rebounds as Triton out-rebounded its hosts 29-22. 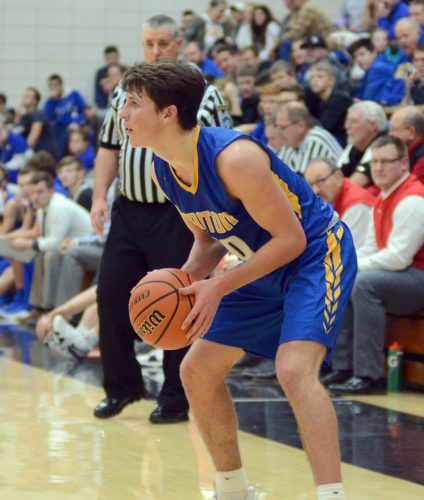 The Panthers got 11 points, four steals and two assists from Haden Krintz in their season-opener after an extended football season that saw the school go 15-0 a second straight season. Calahan Kindley scored eight, and Gage Cripe finished with seven points for Pioneer, which converted only 10 of 42 (23.8 percent) of its shots from the floor. Triton’s JV also won its game, 38-29. Hunter McIntyre finished with nine points and six rebounds, Bruce Johnson scored eight points with three steals, and Tyson Yates put up seven points for the JV Trojans. Triton will play at Bethany Christian next Tuesday. Lakeland Christian Academy had no answer for Noble Dennie, and the Cougars suffered their fourth straight loss on the road at Portage Christian Friday night. Dennie poured in 31 points to lead four players in double figures for the home team. Mikey Lowe scored 12, Danny Gomez finished with 11, and Mason Theriout put up 10 for Portage, which jumped out to an 18-10 lead at the first quarter break, then continued building toward the win. Jake Harmon finished with 17 points and four assists, while Landon Twombly scored 15 with eight rebounds and five assists. Braxton Keller put up eight points and pulled down five rebounds for LCA (1-5). Lakeland will play at North Miami next Tuesday. Lakeland Junior High edged out Warsaw Friday. Seth Martin scored 24 points to lead the Cougars, who moved to 4-0. Warsaw stats were unavailable. Lakeland will play again at home on Saturday against Trinity.